The 18th Annual Spokane International Film Festival begins this Friday, January 29 and runs through Saturday, February 6. Films will be shown at the Magic Lantern Theatre, The Bing, and AMC River Park Square 20, plus there will be a special engagement at the Garland Theater. Visit spokanefilmfestival.org for more information. 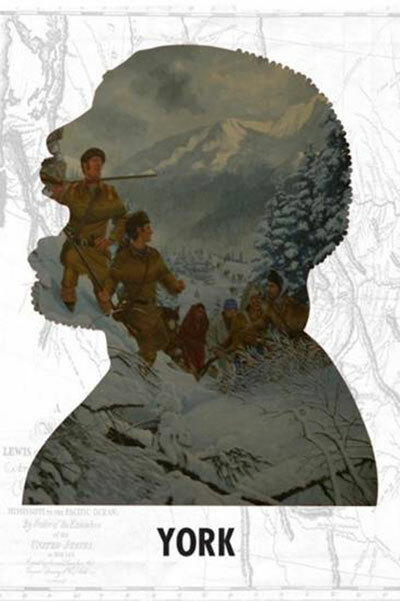 See Lewis and Clark's famous expedition from the eyes of its only black member, York, on stage at the Bing Crosby Theater this Saturday, January 30 at 7:30. Go to bingcrosbytheater.com for more information and tickets. Kosta Panidis' electric blues band, Kosta la Vista, is playing this Friday and Saturday nights, January 29 & 30 from 9 to 1 at MAX at Mirabeau, 1100 N Sullivan. Dining, dancing and drink specials. 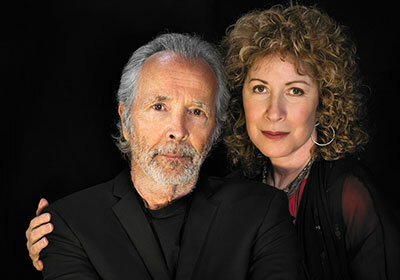 Herb Alpert and his wife, Grammy award-winning singer Lani Hall, will take the stage with their three-piece band, the Spokane Symphony and guest conductor Richard Kaufman this Saturday, January 30 at 8pm at Martin Woldson Theater at The Fox. Alpert is truly a musical icon, whose legendary career spans five decades, and has earned him five No.1 hits, nine Grammy Awards, including one for his 2013 album 'Steppin' Out,' fifteen Gold albums, fourteen Platinum albums and over 72 million records sold. 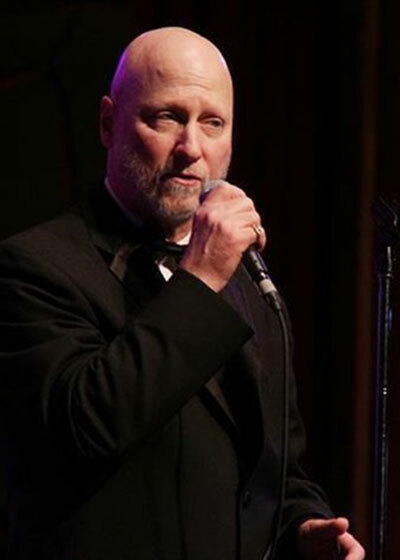 Herb has also dedicated his life to philanthropy and funding music education programs across the country. Lani has the distinction of recording more than 22 albums in three different languages (English, Portuguese and Spanish), four alongside her husband since 1973, Herb Alpert. In 1983, she sang the title song for the James Bond film, 'Never Say Never Again.' In 1986, she walked away with her first Grammy Award for Best Latin Pop Performance for her album, Es Facil Amar. 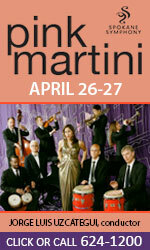 For more concert and ticket information, visit www.spokanesymphony.org. One of Spokane best bands, Chris Rieser and the Nerve, plays at Zola, 22 West Main, this Friday and Saturday nights, January 29 & 30. Zola is featuring a brand new state-of-the-art sound system including QSC K-Series 12 speakers, digital equalizer, advanced Yamaha sound control board and digital limiting system. 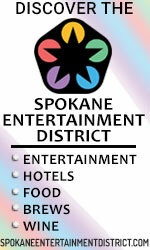 Zola is dedicated to the live music scene here in the Inland Northwest, with live music featured 7 nights a week. Enjoy great service, craft cocktails, award winning food and ice cold draft beer form their new glycol driven draft system. 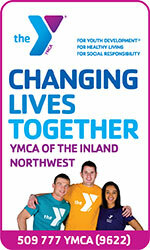 Go to zolainspokane.com for more information. 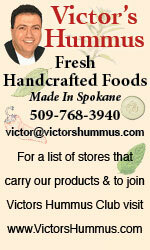 The phone number is 509-624-2416. 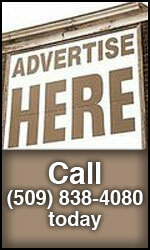 The Spokane Children's Theatre, 2727 N Madelia St, is in the midst of their 70th season. 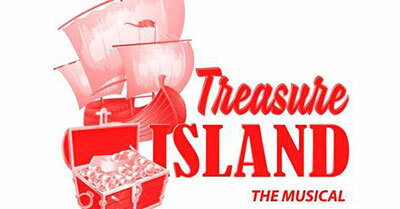 The next show is 'Treasure Island,' opening this Friday, January 29 and running through Sunday, February 14 with shows every Friday at 7pm, Saturday at 2pm, and Sunday 2pm. For tickets and more information go to spokanechildrenstheatre.org. 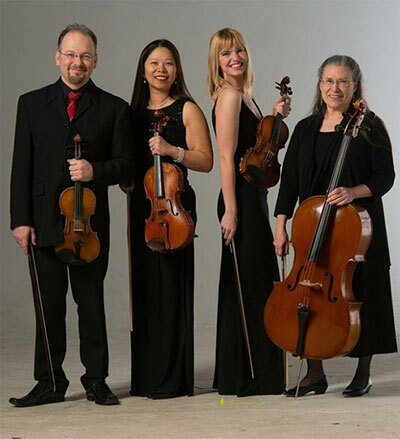 The Spokane String Quartet highlights the romance and passion of the three top Russian composers of the 20th century at a 3pm concert this Sunday, January 31, at the Martin Woldson Theater at The Fox. Two of the composers, Sergei Prokofiev and Sergei Rachmaninoff, were better known for their orchestral works, but showed the same musical genius when they tried their hand at chamber music. The third, Dmitri Shostakovich, is recognized as the master of the craft who composed 15 quartets between the 1930s and his death in 1975. 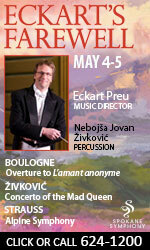 The program includes Prokofiev's String Quartet No. 1 in B Minor, Rachmaninoff's String Quartets No. 1 and No. 2, and Shostakovich's String Quartet No. 1 in C Major. All seats are general admission. Tickets are $20 for adults, $16 for seniors and $12 for students. Ticket prices include a $3 theater preservation fee. 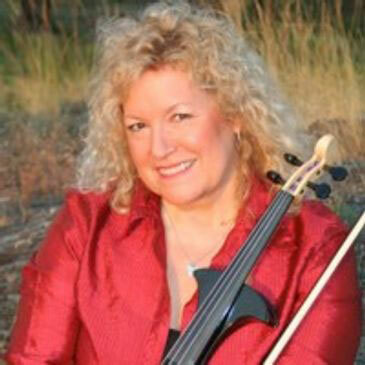 Tickets are available at www.spokanestringquartet.org, www.ticketswest.com, the Fox box office at 509-624-1200 or at the door. The music continues at Arbor Crest's Fireside Music series with two back-to-back performances by Pamela Benton this Thursday & Friday, January 28 & January, both at 5:30-7:30pm. 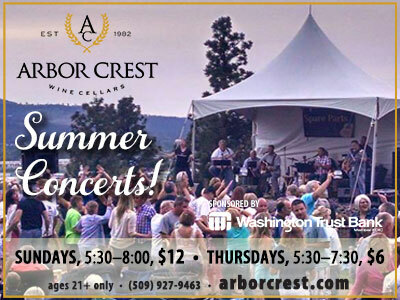 Wine, beer and food are available for purchase in the Tasting Room/Wine Bar on the grounds of Arbor Crest Wine Cellars from 5-8pm. The Spokane Chinese Association's 2016 Chinese New Year Festival, the year of Monkey, will be held at Lair Center, Spokane Community College this Saturday, January 30. The Cultural Fair will be from 1-5pm and the admission is Free. Shows will also take place at 2pm and 5pm. The admission for the shows is $10 for adults, $5 for children 2-12 years old and free for children under two. Door prize drawings will be held at each show and a raffle ticket is included in your ticket. 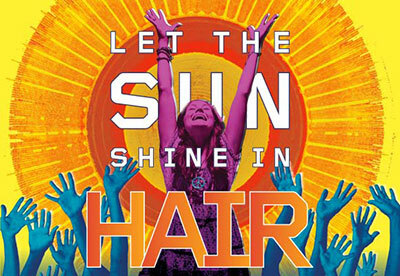 Join Spokane AIDS Network and the cast of 'The Book of Mormon,' this Thursday night, January 28 at nYne Bar and Bistro, for a fun and exciting concert version of 'HAIR, The Musical.' The show begins at 11pm, right after the cast finishes the Thursday evening performance of 'The Book of Mormon' at the INB. This event benefits Spokane AIDS Network and Broadway Cares/Equity Fights AIDS. Nyne Bar & Bistro will be hosting this ONE NIGHT ONLY event. General admission tickets are $10 each and VIP tickets are $25 each (limited tickets available). 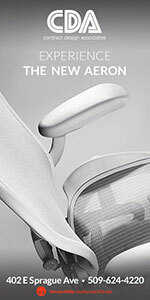 Advance purchase tickets will be available at will call the evening of the event. General admission tickets will also be available at the door as well. 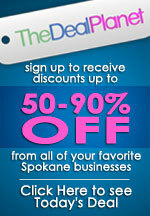 Go to spokaneaids.org to order tickets. 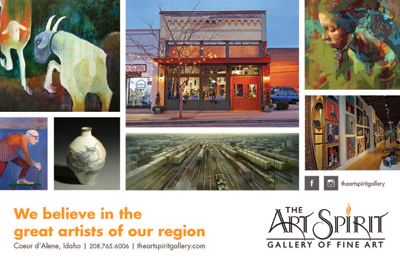 Barrister Winery at 1213 West Railroad Avenue, welcomes 'Selected Artists of The Art Spirit Gallery' once again, for their First Friday event, on Friday, February 5 from 6:30 to 10pm. Share a glass of wine with The Art Spirit Gallery as they present some of the best work by artists from throughout the region, including Harold Balazs, Mel McCuddin, Victoria Brace, Byron Buchanan, George Carlson, Wayne Chabre, Morse Clary, Peter Cox, Mary Dee Dodge, Allen Dodge, Catherine Earle, Del Gish, Elaine Green, Robert Grimes, Gerit Grimm, Michael Horswill, Shelle Lindholm, Jerri Lisk, Kay O'Rourke & Cary Weigand. 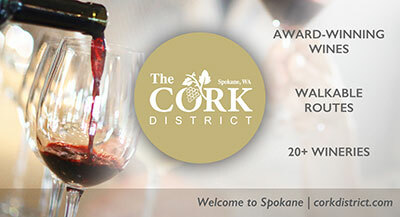 This is the third year that Barrister Winery has invited The Art Spirit Gallery to hang a 'Best Work' show, in celebration of Spokane's First Friday. 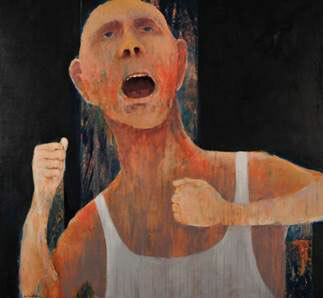 The Opening Reception is February 5 from 6:30-10:00 pm, in conjunction with The Visual Arts Tour. National touring multi-instrumentalist (banjo, fiddle, guitar), songwriter, and modern folk singer Andru Bemis will perform at The Bartlett, 228 West Sprague, on Thursday, February 4, at 8pm. 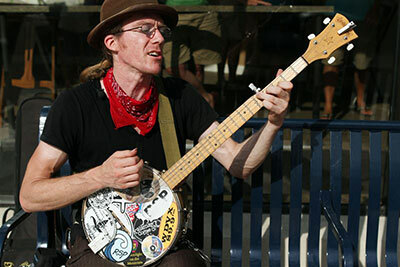 Bemis will be joined by Seattle accordionist and songwriter, Jason Webley. Tickets are $8-$10. 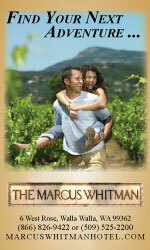 For tickets and more information, phone 509-747-2174 or go to thebartlettspokane.com. You've seen the new film, now experience the classic sounds of 'Star Wars,' live! 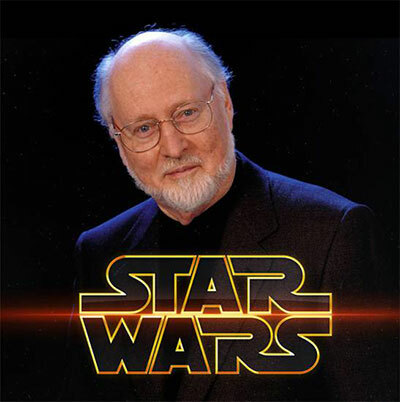 Re-live the adventures of 'Star Wars' as the Spokane Symphony recreates John Williams' iconic music from the unforgettable films. It's Friday, March 4 at Martin Woldson Theatre at the Fox, and Ticketswest has your seats, on sale now at www.ticketswest.com or 800-325-SEAT. 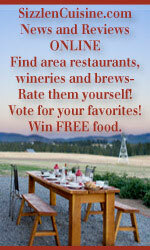 Voting begins tomorrow for the Inlander's Best of the Inland NW! 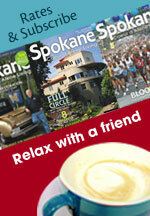 It's that time of year when the Inlander celebrates the Best Of the Inland Northwest. Our region's largest and most popular readers poll kicks off with the ballot published online at www.inlander.com/bestof and in the January 28 issue of the Inlander. 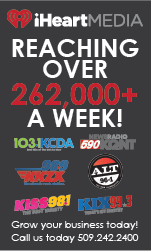 Now is the time to place your ads to encourage votes and to work toward the coveted Best Of award! Voting opens on 1/28/16 and closes at midnight on 2/18/16.